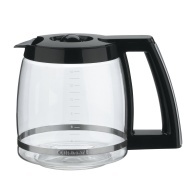 alaTest ha recogido y analizado 213 comentarios relacionados al producto Cuisinart 12-cup Replacement Coffee Carafe. En promedio, la calificación para este producto es 4.4/5, al ser comparado con la calificación 4.2/5 de otros productos en la categoria productos. Los usuarios están encantados con el ruido y el diseño. El funcionamiento y la relación calidad-precio también se valora pero algunos tienen dudas sobre el tamaño. Analizamos las valoraciones de los usuarios y los expertos, la edad del producto y demás factores. Comparado con otros productos el Cuisinart 12-cup Replacement Coffee Carafe recibe una alaScore™ global de 86/100 = calidad muy buena. Hot and flavorful coffee that is easy to use. I love this coffee maker! I have owned two and wouldn't have anything but this particular Cuisinart Classic! One of the best coffee makers on the market. Bought this unit about 16 months ago. It has failed miserably. The switch no longer works, no coffee, no nothing. Would never buy Cuisinart again. I love this coffee maker....simple to use, cleans easily, and looks great. The instant hot water feature is very efficient and is much easier and economical than heating up the teapot!! It was my first time purchasing a coffee maker from Cuisinart and I'm very content on the way it works. Really convenient that there is a hot water dispenser attached to the coffee maker. Coffee comes out very nice and hot!